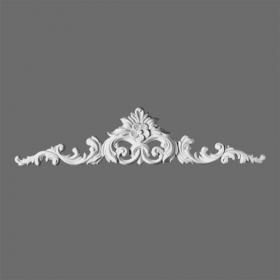 Portal ORAC LUXXUS D170 crowning ornament door and window borders and wall panel segments. The presentation depends entirely on the architect's creativity. In Ancient Greece, the portals were important decorations at the entrance to the temples. Today, they are used to give a unique style and character to any doors. The collection ORAC is a large selection of portals, which together with decorative details, create a unique decorative options. Stucco is pre-coated with a primer paint, , we recommend to after installation stucco paint with acrylic or dispersion paint of the product to an exclusive finish. Portal is resistant to moisture, wash and blow.